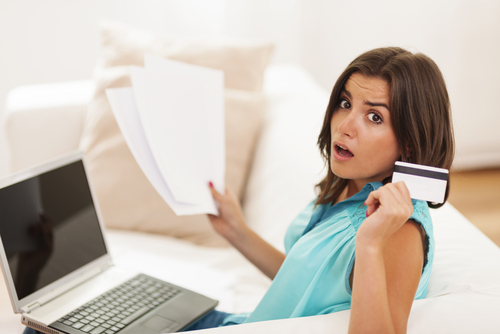 I Can’t Afford All My Credit Card Minimum Payments – Which Should I Pay First? If you’re facing a serious cash-flow crisis and can’t afford to pay every creditor, you might be wondering which bills you should prioritize. After paying rent, your car note and other basic necessities, it’s time to figure out which credit card minimum payments should come first. Take a look at our step-by-step guide. Take stock of all your credit cards. Make a list of their payment due dates, APRs and minimum payment amounts. Don’t automatically start paying according to due date – you’re going to need to keep strategizing before making your first payment. As you record each card’s APR, be sure to take into account the type of borrowing you’ve done. Different actions could carry different APRs, so don’t just assume your regular APR applies. For example, most cards charge one interest rate on purchases and a much higher rate for cash advances. You’ll also want to make a note if any of your cards is a 0% balance transfer deal. These details will all become important when you’re finalizing the order you’ll pay your minimums in (see step 4). If you can transfer all of your credit card balances onto one low-interest or 0% card, this might be a smart move. Moving multiple credit card debts onto one low-rate card is beneficial for two reasons. For one thing, you’ll have paid off all your cards with the new one. This will give you time to scrape together some cash before your new minimum is due. You could also save big bucks on interest if you pay off the new card quickly. Is your credit good? If not, you likely won’t qualify for a 0% balance transfer deal. But you may still be able to get a card with a low, ongoing APR. Will you be disciplined enough to pay off a balance transfer before the interest-free period is up? Does the card you’re looking at charge a balance transfer fee? If it does and you have a lot of cards, the cost of the fees might outweigh the interest savings. It’s also possible to consolidate your debts with a loan from a bank or credit union. This might be a good alternative if you can’t qualify for a decent 0% balance transfer card. And don’t forget about other lenders — Lending Club offers some good consolidation options. In short, it pays to explore all consolidation avenues before missing a payment. Look back over your list of cards and their minimums. Are you already on a 0% balance transfer deal with one of them? If so, this card’s minimum needs to be your first priority. This is because 0% deals are almost always canceled if you make a minimum payment late. You’ll have to start paying interest on your balance immediately, and you’ll get hit with a late fee. This could cost you big bucks, so cards with an introductory 0% rate should get paid – pronto. In general, your next priority should be to pay the cards with the highest APRs. Making these payments will have the biggest impact on your bottom line. The more you pay on credit cards with high APRs, the less you throw away in interest payments every month. But there are caveats to consider. One would be if you can afford to pay a few small minimums instead of one big, high APR minimum. In this case, it would be better to pay all the small ones on time and let the larger one linger. This will minimize black marks on your credit because you’ll be paying one card late instead of several. Another exception would be if you have a card that you’ve never paid late before. Regardless of APR, this card’s minimum should be paid last. This is because you’re most likely to convince an issuer to waive the late fee if it’s your first offense. In fact, some credit card companies have a policy of always forgiving your first late payment. Just remember that defaulting on any credit card has consequences. Be strategic about which minimums you pay first, but be sure to make good on the others as soon as you have the cash. Get into the habit of tracking your spending; this will keep you on track with your budget. The takeaway: If you can’t afford to make all your credit card minimums, be sure to think carefully about which cards to pay first. Also, take steps to be sure you don’t end up in this tough situation again.